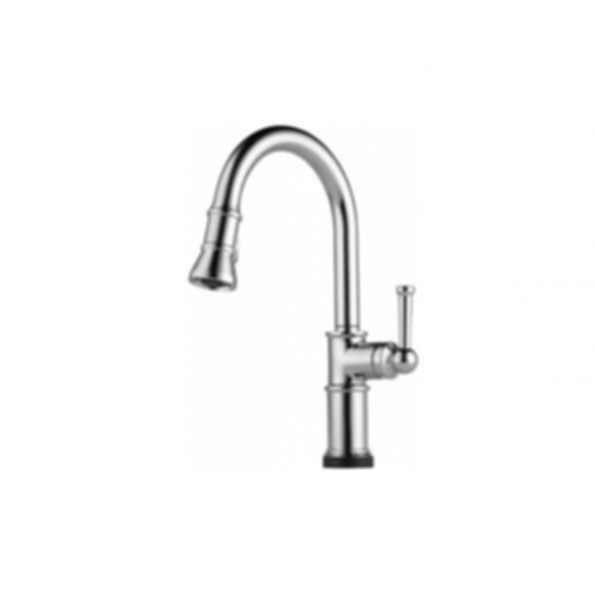 Single handle, 2-function pull-down kitchen faucets for exposed mounting on single or three hole sinks. On/off indicator light also signals when batteries run low. 15 21/32" (398 mm) high, 8 3/4" (222 mm) long, spout swings 360 ̊. Lever handle. Control mechanism shall be full-motion valve cartridge. Pull-down wand operates in an aerated or spray mode via ergonomic button. Dual integral check valves in sprayer. Hose travels inside mounting shank so it will not interfere with deck edges. Maximum flow rate 1.8 gpm @ 60 PSI.